We’ve all been here before…We’re in the gym training and look over to see the person next to us doing something we would consider to be “abnormal” or “sub-optimal”. This could be anything from half-squats, to eccentric bench-press training, to static-holds. However, before we judge too quickly, are there actually some situations where these approaches have logical application? 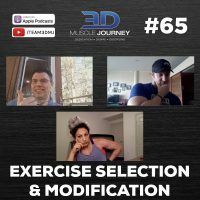 In today’s episode, Andrea, Brad and Eric discuss the rationale behind using different training tools. Techniques covered include: bands, chains, pause-squats, half-squats, heavy walk-outs, tempo-training, and more. As with almost every other nutrition and training related question, the application of these tools is situation dependent. There needs to be specific rationale for your choices, versus simply random application. If you have considered using some of the above methods before, or are currently using them but aren’t quite sure why, today’s episode will serve as a great reference for justification. Hi, firstly guys I love your podcast and I listen to all the episodes. This episode made me think about something and I want to hear your opinion on it, especially Eric as I love his answers! While I was again listening to the episode 65 about exercise selection and modification, I had a big “aha” moment when Eric was talking about how some people are just biologically not built symmetrically (his example: one foot 15 degrees out other 25 degrees out ). After hearing this, I remembered – when I do push-ups my hand placement is never symmetrical, my right hand is always placed 2,5 inches higher than my left hand while performing the push-up. This is the most comfortable and natural position to do push-ups but I always had that thought in my mind- something is wrong with me and this is not the proper way to do it ( i thought my hands need to be placed at the same level). Here goes my question… Would changing my hand placement on the bar – gripping with one hand wider than the other (asymmetrical hand placement on the bar) help me or should I totally ignore the barbell bench press because it doesn’t feel natural to me, while other exercises do? I didn’t try the asymmetrical hand placement yet but wanted to share this with you guys and I know Eric could give me some tip how to do it!